Detached irregular-plan house incorporating fabric of earlier structure, c. 1450, with fabric dating from c. 1650, 1750, 1900 and 1990. Comprising square-plan crenellated tower house, c. 1650, partially recently reconstructed and with recent additions to south, with gable-fronted single-bay two-storey block to west having bay window to west elevation and further crenellated block to south, three-bay two-storey pitched-roofed block to north with further partially constructed pitched-roofed block to north, and single-bay two-storey flat-roofed block to north-west corner. Crenellated parapets to tower house and recent additions. Pitched slate roofs with rendered chimney stacks. Carved limestone copings to gable-front with decorative finial. Cut stone walls to gable-fronted block. Rubble stone walls and concrete walls to tower house. Rubble stone walls to north-west block. Square-headed and pointed arch openings to north and north west blocks, with red brick surrounds. Square-headed openings to gable-fronted block with dressed limestone surrounds, carved limestone label moulding to that to first floor, west elevation. Remains of timber windows to bay window. 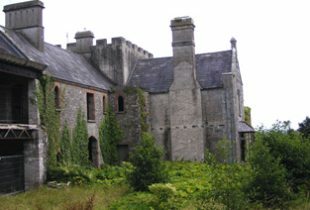 Square-headed openings to tower house and recent additions. Detached three-bay two-storey toll house, c. 1650, to east with pitched slate roof and overhanging eaves, rubble stone walls, pointed arch openings with cut stone voussoirs and sills. Remains of timber windows to some with traceried overlights.